The old translation of the word sin – syn, is not as sinister as modern day would have us believe. Syn translated means missing the mark. At times, we miss the mark. Think archery –aiming to release an arrow from a bow focused on the bull’s eye. Each time we miss the mark, over time and generations, we eventually move so far off our original aim to create a good life, family, home and career. So how do we clear the past and old wounds from our body and right our aim? First, we need to look at our past, our parents’ past, our grandparents’ past to see if we can find where our syns – missing the marks that occurred. Sometimes there are forces out of our control that set in motion deep generational wounds in our bodies. A common generational wound rooted in war that haunts many families across the country could be in your life or someone close to you. Maybe, your grandfather was in a war but never brought up a word of it when he returned home. Instead, he drowned the post-traumatic-stress disorder of war survival with alcohol turning your father’s childhood home into a domestic war zone of neglect, marital combat, violence, emotional landmines, terror, and overall unsafe territory. 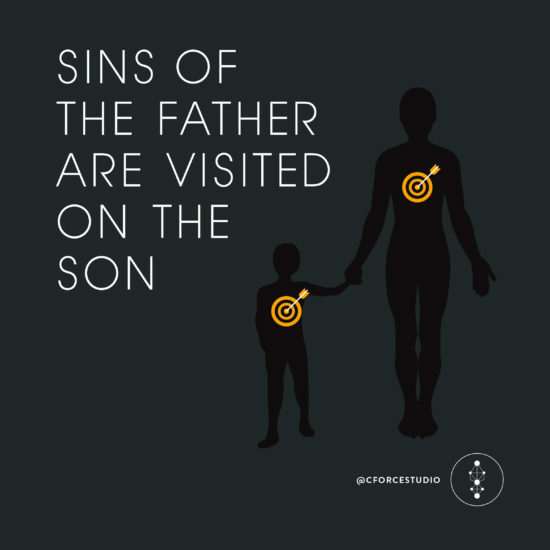 Consequently, your father repeated the domestic war zone in your childhood home and this continues to play out in various ways in your home with your children. When we are so far off the mark – our center – our bull’s eye then it is difficult to heal our own body of pain and disease. It’s a problem of multiple generations not just our own body. It only takes one in the family to step up and say this is going to stop with me. I’m going to be the healer of my body and family. Is this person going to be you? Centripetal Force Studio is derived from the meaning of the force acting upon a body moving along a curved path that is directed toward the center –bull’s eye – to ensure balance and health. We are the force to guide your body to find its center. We will help you to map the pain experienced in your body and life to pinpoint the wounds of the past. Let’s clear the past from our bodies so we can right the old wrongs and right our aim toward a good life now and generations to come. Make an appointment at Centripetal Force Studio with Gina Calderone, the Physical and Energetic Therapist, and Denise Carson, the Body Journalist. Join us on Tuesday, May 7th for our spring Uprising Retreat in Palos Verdes, Calif. A special evening of live music, movement therapy and guiding through your body to uncover the emotional roots of unfinished family business buried deeply within. For more information and to register: Click Here.